Venezuelan President Nicolás Maduro. Photo from his official Facebook page. 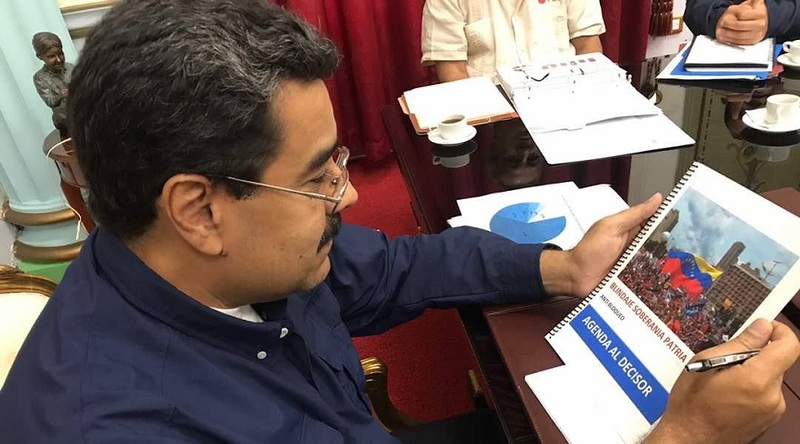 Quoting finance industry sources, opposition legislator Angel Alvarado denounced today that the Venezuelan government of Nicolas Maduro allowed a $1.7 billion gold swap with Germany’s Deutsche Bank AG to lapse. Maduro dejó vencer canje de oro con Deutsche Bank por 1.7 mil millones de $. Se perdieron esos lingotes por seguir negociando mal! "Maduro allowed gold swap for $1.7 billion with Deutsche to lapse. We lost those ingots because we continue to negotiate in the wrong way!" The decision to ignore the terms of the deal, Alvarado said, impacts the liquidity of foreign reserves. About 75 per cent of such reserves were held in monetary gold in August. The funds have already been hit by heavy foreign debt payments and low oil prices and are hovering near 21-year lows. The operation with Deutsche Bank AG involved $1.2 billion in cash given to Venezuela in exchange for putting up $1.7 billion worth of gold in guarantee. The South American country has been doing these kinds of swaps in the past years -as opposed to just selling the gold to gain liquidity- and was supposed to pay back the $1.2 billion by the middle of October to recover the yellow bars. In an interview with Reuters, Alvarado said that the central bank will receive another $500 million in cash to reflect the difference between the amount of the loan and the value of the guarantee. The expiration of the agreement with Deutsche happened almost at the same time Venezuela and its state oil company PDVSA had to pay nearly $3.5 billion in debt service, including maturity payments of $2 billion.